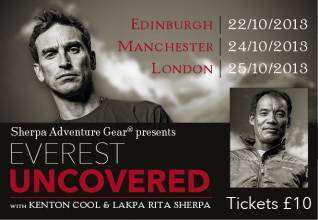 Sherpa Adventure Gear: "Everest Uncovered" - Lecture Tour Edinburgh, Manchester & London - October Dates Announced! Ok, so clearly I’m super stoked to be sitting alongside Kenton Cool and Lakpa Rita Sherpa, two peers from the Sherpa Adventure Gear athlete team for the forthcoming Lecture Tour, Everest Uncovered. Having said that, I’m also uber, uber nervous… and it’s prompted some serious reflection. Who am I as an ‘outdoor affectionado’ (as I don't consider myself a hardened mountaineer!) and what messages can I share which complement the messages of these incredible athletes..? Both Kenton and Lakpa Rita are internationally renowned legends in the world of mountaineering – both on and off the mountain. I’m just a girl who, by chance, fell into climbing 5 years ago when walking up mountains seemed just as enjoyable as skiing down them... and I couldn't afford the lift ticket! Lakpa Rita Sherpa was 2013 Outside Magazine Adventurer of the year. He has reached the summit of Everest 17 times, Cho Oyu 12 times, Pumori twice, as well as Shisapangma and Ama Dablam. He has also climbed Mt. Vinson, Denali, Aconcagua and attempted K2 and the south face of both Annapurna and Shishapagma. Clearly he has a penchant for altitude..! Kenton Cool is a bit of a legend in his own right (understatement of the year!). He’s the first European to summit Everest 11 times and the first non-Asian to summit Everest twice in one week. His achievements hit the headlines earlier this year when he summited Everest, Lhotse and Nuptse in one week. Additional accolades include guiding Sir Ranulph Fiennes to the summit of Everest and the Eiger (raising £3m for Marie Curie Cancer Care) and holding the title of being the only Briton to ski down two 8000m mountains. Between them, these men share a total of 28 Everest summits and a unique outlook on the history and future of the world’s highest peak. So who am I and what can I tell you about Everest..? Somehow I've made all this fit - amazing what you can do with your time if you're dedicated to setting and achieving goals..! So what’s my message going to be? Good question… I’m pretty average – I have 24 hours in my day just like the rest of the world. In those 24 hours per day, I’ve made good decisions, I’ve made bad decisions, I’ve gained a lot in life-experiences but have sacrificed an equal amount… My collection of strappy shoes and oversized handbags is nearly as extensive as my collection of mountain boots and padded-out packs. But everyone has their ‘thing’. One thing that seems to have worked in my favor has been my ‘can do’ attitude. I find myself saying, ‘yes, why not, I’ll give that a shot’ more often than I say ‘no, I can’t do it’. This attitude filters across all aspects of my life – both at work and on the mountain. It’s required a lot of courage, commitment and discipline…. And some creativity! And this attitude ultimately led me to the mountains where I discovered myself and met a plethora of people who have truly inspired me and continue to inspire me every day. I've often been asked if climbing has become an obsession… I’d certainly argue no. I think that my ‘obsession’ is pursuing things that I feel passionate about – which I have an uncanny knack of ‘packaging’ as adventures. I love climbing but it’s not an obsession in its own right. Climbing, like my job, serves as a vehicle that enables me to challenge myself emotionally, mentally and physically. I plan adventures every day but these adventures are as much about self-discovery and awareness as they are about physical challenges. 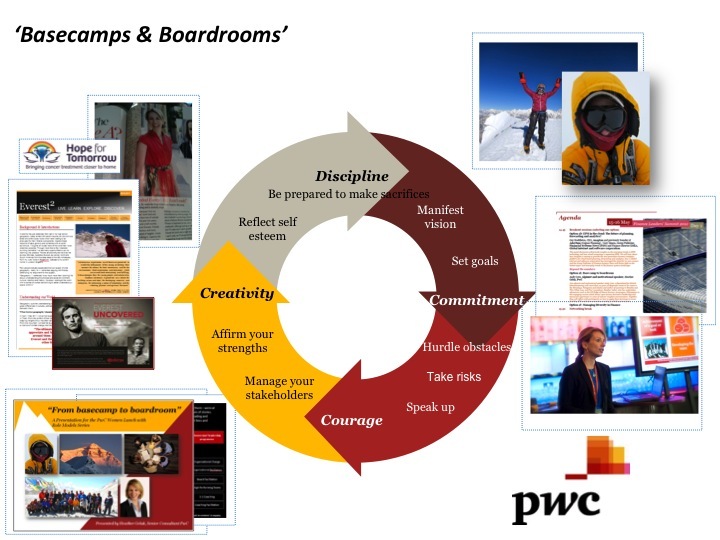 For example, I’m currently planning my ‘adventure’ for the Spring, then I’ve got a big challenging work-project to tackle while planning for my next assignment followed by organizing an expedition to lead a group of women to climb Kilimanjaro. Scattered between these milestone events are adventures like learning how to use my new iphone and meeting my new goddaughter. So, I haven’t quite figured out what I’m going to say or how I’m going to say it but I have some ideas and look forward to taking some of the experiences I've had and people that I've met and contributing to this fascinating evening of discussion and debate. If you’re interested in a fun evening out, fancy learning something about Everest, and possibly discovering something about yourself in the process, I encourage you to come out for the evening..! Details can be found on the Sherpa Adventure Gear website. Really looking forward to sharing an enjoyable evening with you..! Doors Open at 6pm, lecture starts at 7pm.